The graham barstool offers contemporary styling for a modern look. Its clean, curvy lines are emphasized by the deep red bonded leather cover. The unique shape features a slightly winged back and seat that offers a comfortable spot to enjoy a cold drink and great conversation. The chrome base and footrest are the perfect complements to this stool, completing this modern design. Not only is graham visually striking, it is also extremely functional. 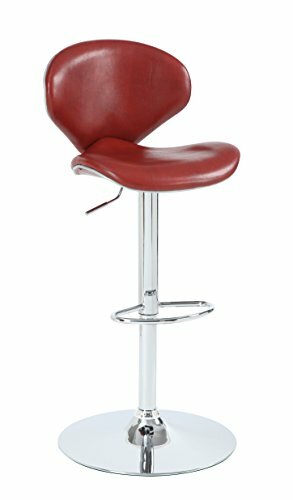 Easily raise or lower the seat with the simple pull of the adjustment Lever to enjoy counter for bar Height seating, allowing for use in multiple areas. The unique Shape features a slightly winged Back and Seat that offers a comfortable spot to enjoy a cold drink and good conversation. Sleek design creates a contemporary Styling for a modern look. Adjustable Height between 35.5in. And 45.5in. 360 degree swivel. If you have any questions about this product by Stylistics, contact us by completing and submitting the form below. If you are looking for a specif part number, please include it with your message.